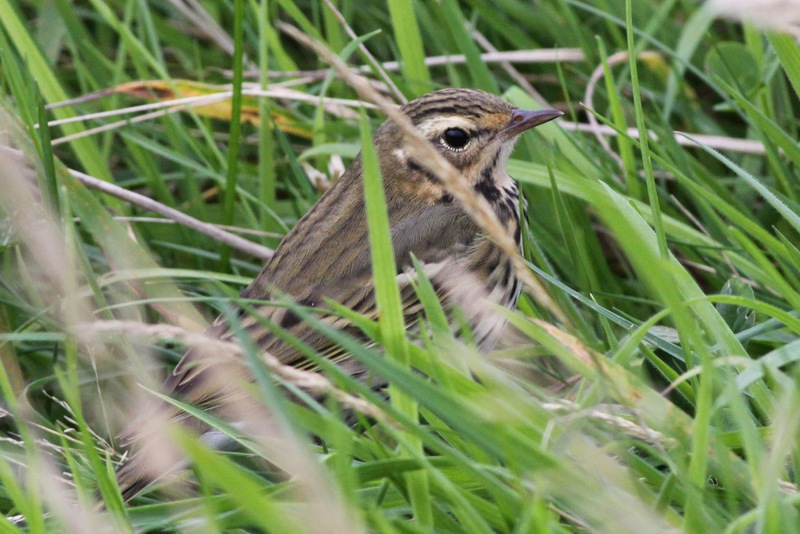 A strong NW wind on Sunday brought an unsurprising lack of birds, although going against the grain somewhat was a smart Olive-backed Pipit found lurking in long grass around the Quoy allotment, whilst a good spread of lingering migrants made for a pleasant day in the field. Although incredibly elusive at times, the OBP at Quoy could be watched feeding in the grass down to around 2 metres. Monday opened very calm, the perfect conditions for a bit of drifty movement and early signs were promising, with a Barred Warbler and Reed Warbler trapped in the morning (further Barred Warbler sightings during the day at Barkland, School, Vaila’s Trees, Schoolton, Burkle and Haa were all thought to be the same wandering individual). Whilst there didn’t seem to be huge numbers of new birds in, it felt good and, sure enough, an Arctic Warbler was found near North Shirva during morning census. Although not exactly a ‘Fair Isle special’, this is about the 90th record of this species for the island and it is still not easy to connect with in most of the UK (in my home county of Durham for example, I reckon there’s only been one record since I saw my first on Hartlepool Headland back in 1996 – there are probably more people who’ve seen Eastern Crowned Warbler in the county than Arctic!). Perhaps only on Fair Isle would a BB rarity be a ‘good sign’ rather than the day’s stand-alone highlight, but we were certainly hopeful for more and, just as hope seemed to be fading with the light (and the onset of light rain), visiting birders Micky Maher, Martin Culshaw and Phil Harris found Fair Isle’s 89th Lanceolated Warbler near the roadside between Midway and Upper Leogh. Thanks to their swift reporting, an entire Obs-full of guests was able to enjoy this fearless locustella giving great views before dinner (we were only slightly late back, but the kitchen staff were very understanding again!). 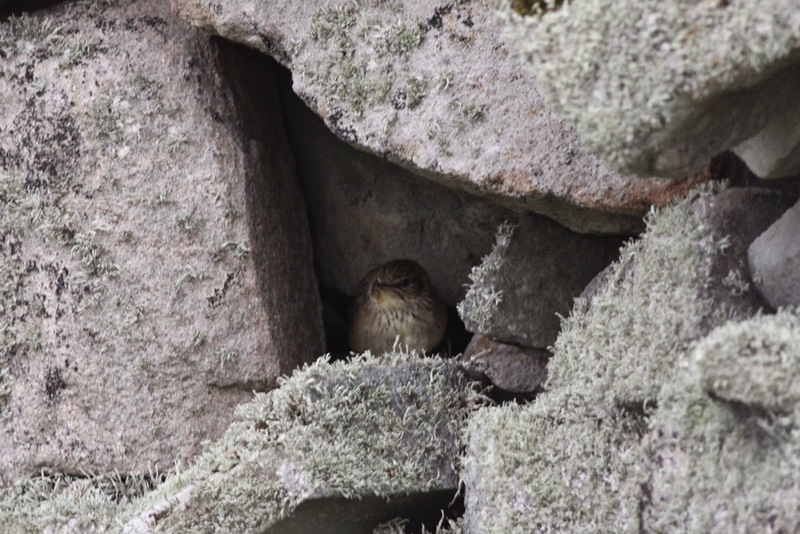 The Lancie showed very well (although I only managed a couple of rubbish record shots as it hid in a hole in a wall) often giving views down to just a few feet away. There will be much better photos from other people to come! The atmosphere at Log in the evening was understandably merry as people compared photos and relived the encounter, whilst the day’s other birds made for an impressive back-up cast with Olive-backed Pipit, Red-throated Pipit, Rose-coloured Starling, Bluethroat, 3 Yellow-browed Warbler, 2 Common Rosefinch and 5 Lapland Bunting all out there to be enjoyed. Also new for the autumn were 2 Linnets and a skein of 16 Barnacle Geese. 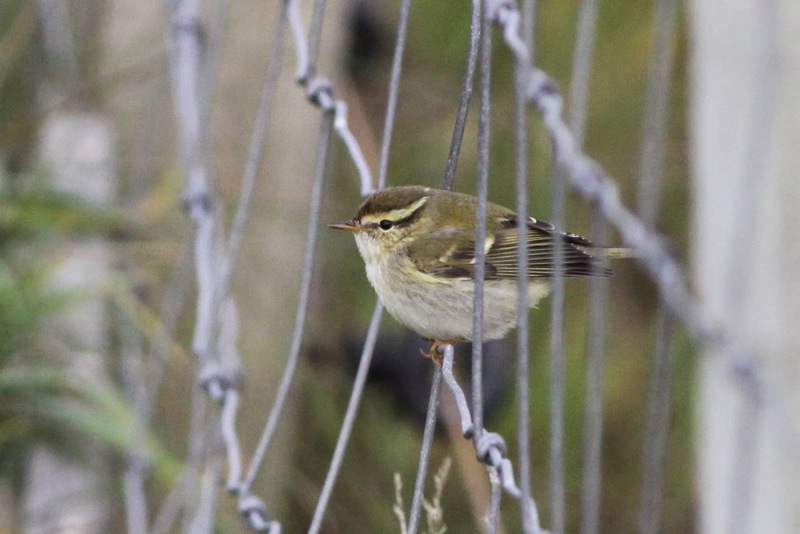 Yellow-browed Warbler at Quoy, part of an impressive supporting cast of birds on a really good day's birding.